Prominent & Leading Exporter from Palghar, we offer belts conveyor for pharmaceutical industry. 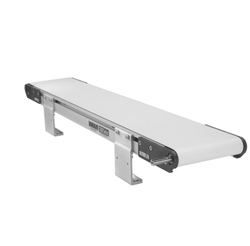 Finding suitability for conveying of products in pharma sector, these Belts Conveyor for Pharmaceutical Industry provides for superior working precision and control over involved processes. These dependable conveying machines also meet the defined industry standards and provide for reliable conveying support in involved manufacturing operations. Some of the applications these are used in include for filling drums with pills, high speed bottle filling, compression of pills, in blister packaging inspections and others. The specific construction of conveyors also helps in preventing cross contamination possibility between different batches. Some of its features include easily accessible design to maintain effective sanitation as well as economical working costs, meeting demands of clean room production, suitable for assembling and packaging of products like syringes, bandages, gauzes, surgical instruments and others.